I created this site to help all food lovers to dispel the myths surrounding Indian cooking. Indian cuisine is so diverse that you could eat a different dish every day of the year. 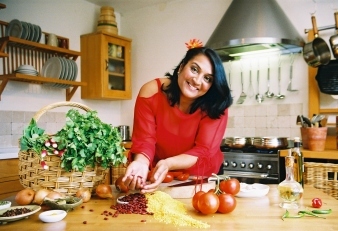 I am passionate about Indian food and wanted to share the knowledge that has been passed down to me by my family, which will enable you to cook Indian food with confidence. I am a home cook, not a chef. This helps me put together recipes that are easy to follow and show the simplicity of cooking traditional Indian dishes. This site will also show that European dishes can be given a new twist with some simple Indian touches, creating classics in their own right. I hope you have as much fun cooking and learning through my website as I have had creating it! Why did I create this site? Well, my first appearance on television was when I entered the Chef Star 2002 competition run by UK Food's flagship programme Good Food Live. I made it all the way to the final but alas was pipped into second place. This experience showed me that there was so much love of Indian food in the UK that I wanted to broaden people's horizons even further. I thought that in my small way I could show just how vast and diverse the cuisine of India is and just how easy it is to buy all the ingredients in the UK, whether they are spices, herbs or vegetables.